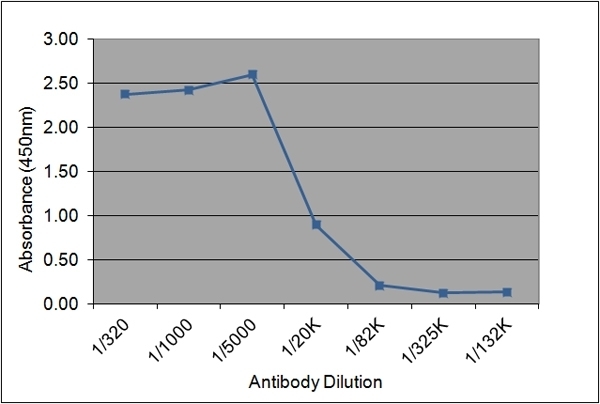 Human insulin like growth factor I detected with Mouse anti Human Insulin Like Growth Factor I (MCA5822G) followed by HRP conjugated Rabbit F(ab')2 anti Mouse IgG (STAR13B). Mouse anti Human insulin-like growth factor 1, clone 175.2E7 recognizes human IGF-I (Insulin-like Growth Factor I), a 70 amino acid secreted mitogenic polypeptide and member of the insulin gene family, produced primarily by the liver. IGF-I exhibits both autocrine and paracrine properties and has a widespread effect on cells. Mouse anti Human insulin-like growth factor 1, clone 175.2E7 does not cross react with IGF-II.